<!-black-> What is this bible book about? Obadiah's prophecy fortells a devastating judgment against the nation of Edom by God. The book of Obadiah has only one chapter with 21 verses. Obadiah is the shortest prophecy and the smallest book in the Old Testament. Obadiah wrote this bible book that is named after him. His name means "servant of the Lord" or "a worshipper of Jehovah God." He was a man of deep convictions, patriotic, stern, and dared to put to words the flaming indignation in his soul against the Edomites. There are 12 Obadiahs mentioned in the bible and he is not to be confused with any other of these. Other than this, there is not much known about him. This bible book was probably written somewhere in Judah. When did the happenings of verses 11-14 take place? There are two major times this could have happened. I refer to it as the early date and the late date. <!-purple-> "During Jehoram's reign, the Edomites revolted against Judah and crowned their own king. So Jehoram went with all his chariots to attack the town of Zair. The Edomites surrounded him and his charioteers, but he escaped at night under cover of darkness. Jehoram's army, however, deserted him and fled. Edom has been independent from Judah to this day"
<!-black-> The Edomites were at war with Judah in that time period. At that time the Philistines and Edomites invaded Judah and sacked Jerusalem. <!-red-> "The people of Gaza have sinned again and again, and I will not forget it. I will not let them go unpunished any longer! They sent My people into exile, selling them as slaves in Edom"
<!-black-> This early date appears to fit in well with the historical context of this bible book. (597-586 B.C.). If we accept the late date, then the prophet, Obadiah, was also alive at the same time as the prophet, Jeremiah, and was also in Judah. There were other prophets in Judah at that time so it is possible that Obadiah was one of them. <!-purple-> O Lord, remember what the Edomites did on the day the armies of Babylon captured Jerusalem. "Destroy it!" they yelled. "Level it to the ground!" <!-purple-> They cast lots to decide which of my people would be their slaves. They traded young boys for prostitutes and little girls for enough wine to get drunk. <!-red-> "What do you have against Me, Tyre and Sidon and you cities of Philistia? Are you trying to take revenge on Me? If you are, then watch out! I will strike swiftly and pay you back for everything you have done. You have taken My silver and gold and all My precious treasures, and you have carried them off to your pagan temples. You have sold the people of Judah and Jerusalem to the Greeks, who took them far from their homeland"
<!-black-> Obadiah tells Edom that they will not escape God's punishment. Was this prophecy fulfilled? Yes. Several years after Judah fell, King Nebuchadnezzar of Babylon conquered the nation of Edom and hauled them off as slaves to Babylon. <!-red-> "Where are all the wise men of Teman? Is there no one left to give wise counsel? Turn and flee! Hide in deep caves, you people of Dedan! For when I bring disaster on Edom, I will punish you, too! Those who harvest grapes always leave a few for the poor. If thieves came at night, even they would not take everything. But I will strip bare the land of Edom, and there will be no place left to hide. Its children, its brothers, and its neighbors- all will be destroyed- and Edom itself will be no more. But I will preserve the orphans who remain among you. Your widows, too, will be able to depend on Me for help." <!-red-> "If the innocent must suffer, how much more must you! You will not go unpunished! You must drink this cup of judgment! For I have sworn by My own name," says the Lord, "that Bozrah will become an object of horror and a heap of rubble; it will be mocked and cursed. All its towns and villages will be desolate forever." <!-red-> "I will cut you down to size among the nations, Edom. You will be despised by all. You are proud that you inspire fear in others. And you are proud because you live in a rock fortress and hide high in the mountains. But don't fool yourselves! Though you live among the peaks with the eagles, I will bring you crashing down," says the Lord. "Edom will be an object of horror. All who pass by will be appalled and will gasp at the destruction they see there. It will be like the destruction of Sodom and Gomorrah and their neighboring towns," says the Lord. "No one will live there anymore. I will come like a lion from the thickets of the Jordan, leaping on the sheep in the pasture. I will chase Edom from its land, and I will appoint the leader of My choice. For who is like Me, and who can challenge Me? What ruler can oppose My will?" <!-purple-> "Listen to the Lord's plans for Edom and the people of Teman. Even the little children will be dragged off, and their homes will be empty. The earth will shake with the noise of Edom's fall, and its cry of despair will be heard all the way to the Red Sea. The enemy will come as swiftly as an eagle, and he will spread his wings against Bozrah. Even the mightiest warriors will be as frightened as a woman about to give birth"
<!-black-> Many prefer the late date because they see the destruction of Jerusalem and the destruction of Edom taking place at nearly the same time. <!-black---------------------------------------> Why was this book written? The people of Edom rejoiced in the destruction of God's people. They were selfish, indifferent, hostile, and considered dangerous because they grabbed part of the spoils of war from those in Jerusalem who they helped conquer. One would naturally assume that since Esau and Jacob were brothers that there should be some kind of loyalty bond between their descendants but just the opposite was true. They were long term enemies. <!-black-> It seems to me that there is one primary reason for the writing of this bible book and that is the fact that God is giving a message to Edom that He is going to destroy that nation once and for all. Why? Because Edom had become reprobate (beyond the hope of salvation) so it was not salvagable. I bought a used car one time that had the word "salvage" written on the ownership title. The car had been damaged but was repaired and ready for use again. After I purchased it, it was a good car for me and I drove it for several years until it quit running. But Edom was a total wreck that could not be salvaged. This is in contrast to the City of Nineveh in Assyria that was salvagable many years before. Because God thought it was salvagable, He sent the prophet Jonah there to preach to them. As a consequence the city repented and was not destroyed at that time. But this was not the case with Edom. <!-black-> To understand this historical setting we have to understand the story of how it all began. Esau and Jacob were twin brothers. They were very different yet they had the same mother and father and were each taught to love and serve God. Esau was the first born son who was to receive the birthright. A birthright in those days meant that its owner was to receive the entire family fortune by inheritance. <!-black-> Let me illustrate with a story of my own. One time I worked as a fork lift driver at a winery in California in 1975. The company had torn down the old vinegar plant and told the employees that we could have free any of that lumber that was there if we hauled it off ourselves. My younger brother and I drove there with a pickup truck and loaded up all the choice pieces of lumber that we wanted. Our earthly father agreed to store this lumber for us until we might have use for it. So we stacked it neatly in his big back yard out of the way. Then one day without telling us, he sold all of that lumber for $20 (that is when $20 bought something) and kept the money. When my brother and myself found the lumber missing, we asked our father about it and he told us what he had done. My brother and I just looked at each other and shrugged our shoulders. There was nothing we could do about it because we knew how he was when it came to money. So I think I can understand how Jacob must have felt when he found out that his father was planning on cheating him out of his inheritance. These kinds of actions can lead to hard feelings in some families. <!-red-> "Yet Jacob I have loved; But Esau I have hated"
<!-black-> (Malachi 1:2-3). Why? For the most part, the descendants of Jacob (Israel) would love and serve God, but the descendants of Esau would love and serve Satan. I believe that verse 4 is a double reference verse. Why? On one hand, this verse appears to refer to the pride of Edom as it is tied in with verse 3. But every time I read it I am impressed that it also refers to the pride of Satan. I believe that the sin of pride is the major iniquity that brought Lucifer (Satan) down in the beginning. <!-black-> What was the devil doing with Edom? Edom was owned by the devil because those individuals worshipped the devil. He had a real stronghold there. The Edomites did what the devil wanted them to do. And what was that? Verses 10-14 indicate that Edom always acted with hatred and hostility towards the Israelites. <!-purple-> "Nevertheless the Lord your God would not listen to Balaam, but the Lord your God turned the curse into a blessing for you, because the Lord your God loves you"
<!-red-> "You have skirted this mountain long enough; turn northward. And command the people, saying, "You are about to pass through the territory of your brethren, the descendants of Esau, who live in Seir; and they will be afraid of you. Therefore watch yourselves carefully. Do not meddle with them, for I will not give you any of their land, no, not so much as one footstep, because I have given Mount Seir to Esau as a possession. You shall buy food from them with money, that you may eat; and you shall also buy water from them with money, that you may drink. For the Lord your God has blessed you in all the work of your hand. He knows your trudging through this great wilderness. These forty years the Lord your God has been with you; you have lacked nothing." <!-red-> "You shall not abhor an Edomite, for he is your brother. You shall not abhor an Egyptian, because you were an alien in his land"
<!-purple-> "While Moses was at Kadesh, he sent ambassadors to the king of Edom with this message: "This message is from your relatives, the people of Israel: You know all the hardships we have been through, and that our ancestors went down to Egypt. We lived there a long time and suffered as slaves to the Egyptians. But when we cried out to the LORD, He heard us and sent an angel who brought us out of Egypt. Now we are camped at Kadesh, a town on the border of your land. Please let us pass through your country. We will be careful not to go through your fields and vineyards. We won't even drink water from your wells. We will stay on the king's road and never leave it until we have crossed the opposite border." But the king of Edom said, "Stay out of my land or I will meet you with an army!" The Israelites answered, "We will stay on the main road. If any of our livestock drinks your water, we will pay for it. We only want to pass through your country and nothing else." But the king of Edom replied, "Stay out! You may not pass through our land." With that he mobilized his army and marched out to meet them with an imposing force. Because Edom refused to allow Israel to pass through their country, Israel was forced to turn around"
<!-black-> After that Edom became Israel's permanent hostile neighbor for hundreds of years and they had one problem after another. <!-black-> The Edomites were hostile to the Israelites during the period of the Maccabees (the 400 year period of time between the old and new testaments). And King Herod was an Edomite. Maybe that is one reason he could easily order the male children of Bethlehem to be put to the sword in his attempt to kill baby Jesus. <!-black-> Edom was destroyed more than once: A few years after the destruction of Jerusalem, King Nebuchadnezzar marched his Babylonian army down the Valley of Arabah toward Egypt and conquered the Edomite nation. 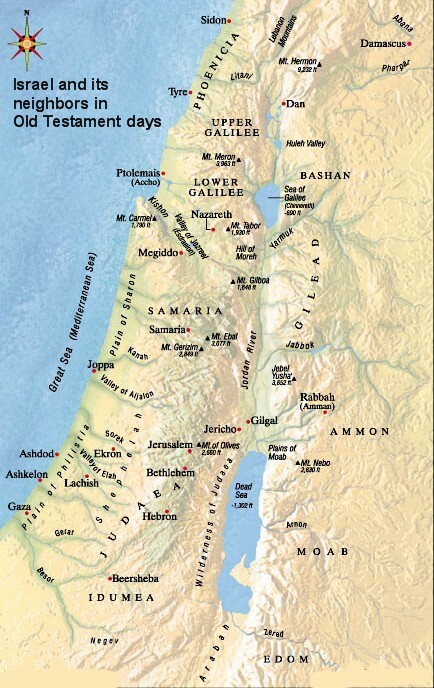 They were conquered again by the Romans under General Titus in 70 A.D. after Jerusalem was burned to the ground. Edom ceased to be a nation at that time and it is still so to this day. All the prophecies of God against Edom have been fulfilled. <!-purple-> "Come near, you nations, to hear; And heed, you people! Let the earth hear, and all that is in it, the world and all things that come forth from it. For the indignation of the Lord is against all nations, and His fury against all their armies; He has utterly destroyed them, He has given them over to the slaughter. Also their slain shall be thrown out; Their stench shall rise from their corpses, and the mountains shall be melted with their blood. All the host of heaven shall be dissolved, and the heavens shall be rolled up like a scroll; All their host shall fall down as the leaf falls from the vine, and as fruit falling from a fig tree. For My sword shall be bathed in Heaven; Indeed it shall come down on Edom, and on the people of My curse, for judgment. The sword of the Lord is filled with blood, It is made overflowing with fatness, with the blood of lambs and goats, with the fat of the kidneys of rams. For the Lord has a sacrifice in Bozrah, and a great slaughter in the land of Edom. The wild oxen shall come down with them, and the young bulls with the mighty bulls; Their land shall be soaked with blood, and their dust saturated with fatness. For it is the day of the Lord's vengeance, the year of recompense for the cause of Zion. Its streams shall be turned into pitch, and its dust into brimstone; Its land shall become burning pitch. It shall not be quenched night or day; Its smoke shall ascend forever. From generation to generation it shall lie waste; No one shall pass through it forever and ever. But the pelican and the porcupine shall possess it, also the owl and the raven shall dwell in it. And He shall stretch out over it The line of confusion and the stones of emptiness. They shall call its nobles to the kingdom, but none shall be there, and all its princes shall be nothing. And thorns shall come up in its palaces, nettles and brambles in its fortresses; It shall be a habitation of jackals, a courtyard for ostriches. The wild beasts of the desert shall also meet with the jackals, and the wild goat shall bleat to its companion; Also the night creature shall rest there, and find for herself a place of rest. There the arrow snake shall make her nest and lay eggs and hatch, and gather them under her shadow; There also shall the hawks be gathered, every one with her mate. Search from the book of the Lord, and read: Not one of these shall fail; Not one shall lack her mate. For My mouth has commanded it, and His Spirit has gathered them. He has cast the lot for them, and His hand has divided it among them with a measuring line. They shall possess it forever; From generation to generation they shall dwell in it"
The theme of this book is Jesus Christ is our Witness Against Rebellious Nations. <!-black-> Are there any hidden nuggets of truth in this small bible book of Obadiah? Yes, I believe there are. What are they? <!-black-> 1). We can observe that human defenses are absolutely powerless against God and the judgment of God can come on all who are proud and rebellious. Universal justice will prevail and the deliverance of God can come on all who are humble, meek, and obedient to God. Pride goes before destruction and a prideful spirit before the fall. <!-purple-> How are the things of Esau searched out! how are his hidden things sought up! <!-black-> The descendants of Jacob would love and serve God, but, the descendants of Esau would love and serve Satan. These are the things of Esau that are being "searched out." And Esau's "hidden things" for his secret Satanic service has been "sought out" and brought to light to reveal the sin, rot, and corruption of such service. <!-red-> "Though they dig into hell, from there My hand shall take them; though they climb up to heaven, from there I will bring them down"
1 Chronicles chapter 21. We can learn as individuals and as a nation from the bad example set by Esau and the Edomites. <!-red-> "The day is near when I, the Lord, will judge the godless nations! As you have done to Israel, so it will be done to you. All your evil deeds will fall back on your own heads. Just as you swallowed up My people on My holy mountain, so you and the surrounding nations will swallow the punishment I pour out on you. Yes, you nations will drink and stagger and disappear from history, as though you had never even existed"
(Obadiah verses 15 and 16). <!-black-> Is this Law of Sowing and Reaping taught anywhere else in scripture? Yes. <!-red-> "Judge not, that you be not judged. For with what judgment you judge, you will be judged; and with the measure you use, it will be measured back to you"
<!-purple-> "Do not be misled. Remember that you can't ignore God and get away with it. You will always reap what you sow!" <!-red-> "Leave your country, your relatives, and your father's house, and go to the land that I will show you. I will cause you to become the father of a great nation. I will bless you and make you famous, and I will make you a blessing to others. I will bless those who bless you and curse those who curse you. All the families of the earth will be blessed through you"
(Genesis 12:1-3). <!-black-> Abraham is not only the physical father of the Israelites but also the spiritual father by faith of those in the church. God has a future plan and purpose for Israel after the church leaves this earth in the rapture. <!-black-> 6). One might be able to make an allegory in regards to Esau and Jacob. Esau or Jacob could represent a spiritual condition inside of every saved person. Esau could represent the flesh while Jacob could represent the spirit. Inside of a saved person there is a daily and continual fight against inherent depravity. You and I have to make a choice every day as to which one will rule in our life. You got any scripture for that concept? Yes. <!-purple-> "For the flesh lusts against the Spirit, and the Spirit against the flesh; and these are contrary to one another, so that you do not do the things that you wish"
(Galatians 5:17). <!-black-> Let's hope that you and I choose the spirit and have daily victory over our flesh and it's depravity. <!-black-> 7). The Day of the Lord in the bible book of Obadiah refers not only to Edom's utter destruction, but to Israel's salvation and the establishment of their Messiah's kingdom. Jesus Christ as their Messiah will rule the world from Jerusalem in some future day. <!-purple-> "That day is a day of wrath, a day of trouble and distress, a day of devastation and desolation, a day of darkness and gloominess, a day of clouds and thick darkness, a day of trumpet and alarm against the fortified cities and against the high towers. <!-red-> "I will bring distress upon men, and they shall walk like blind men, because they have sinned against the Lord; Their blood shall be poured out like dust, and their flesh like refuse. Neither their silver nor their gold shall be able to deliver them in the day of the Lord's wrath; But the whole land shall be devoured by the fire of His jealousy, for He will make speedy riddance of all those who dwell in the land"